As the dust settles on Minnesota’s 2017 legislative session, the push for new pollinator protective policies has mostly wrapped up for the year. The outcome? In a year when many, many issues we care about saw major rollbacks, we managed to win a few small victories for pollinators — and hold back the worst proposals that would’ve gutted our state’s pesticide laws. But legislative leaders were remarkably unwilling to look for solutions to the pesticide and pollinator problem, and there is much work still to do. 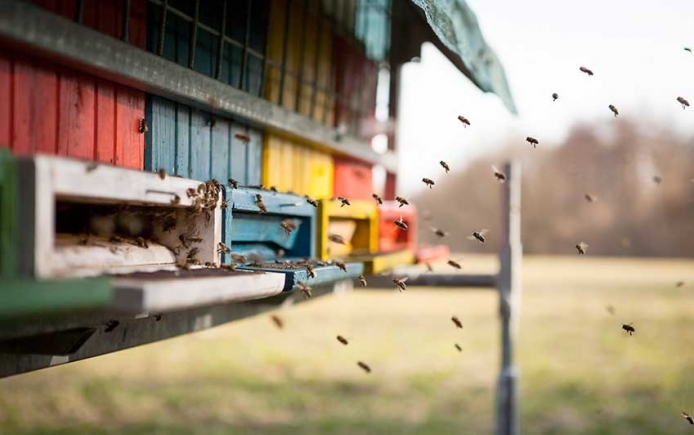 The latest statistics on annual losses of honey bee colonies were just released, and while the losses are lower than in recent years, they are still well above what beekeepers consider sustainable. Close a legal loophole that exempts pesticide seed treatments from the laws that dictate all other pesticide uses. From the start of the legislative session, PAN was working in full support of these bills. And we were not alone. Across the state, support for pollinator protections is strong and deep. In a statewide poll conducted earlier this year, 87% of Minnesotans said that they were concerned about pollinator declines; and the two policy proposals the state was considering had the support of 69% and 82% of Minnesotans, respectively. When agriculture committees held hearings on their policy and budget bills, people spoke up loudly for pollinators. Farmers who rely on insects to pollinate their crops, farmers who grow corn and soybeans without relying on neonicotinoid seed treatments, beekeepers, and native pollinator experts drove from many parts of the state to testify. Some who couldn’t make the trip wrote letters to local papers and asked tough questions at town hall meetings. But some legislators weren’t listening. And early in the session, lawmakers eliminated all pollinator components of the agriculture bills — and made moves to undermine pesticide rules across the state. Talk about a step in the wrong direction. All in all, the legislative session is ending with mixed results for our work on pollinators. Governor Dayton vetoed legislation that would’ve undermined the Department of Agriculture’s authority to regulate pesticide use, and sent it back to legislators for more work. After some language revisions, he signed the bill into law last week. The current agriculture bill includes a few small advances. MDA is authorized to work on research to minimize the impacts of pesticides on pollinators, but unfortunately language intending to undermine a new “verification of need” program also passed, narrowing the agency’s authority to make science-based decisions on pesticide policy. And in a bait-and-switch move, legislators removed funding for the pollinator protection account and substituted research at the University of Minnesota, which focuses primarily on habitat. This research will likely generate good information about on-farm pollinator habitat, but it leaves a major research gap the state previously identified on pest thresholds for key Minnesota crops — including integrated pest management (IPM) research on pollinator-friendly approaches to keeping crop yields and farm incomes strong. Although the state legislature missed a major opportunity to tackle the issue of neonic use — specifically as seed coatings — the science calling attention to the pollinator problem continues to build. Every year, about 9 million acres of neonic-coated seed are planted in Minnesota, mostly corn. And according to a new report released by the Center for Food Safety, “it is uncommon for neonic seed coatings to increase corn yield.” Additionally, the report finds that there is minimal evidence that the pest problems neonic seed treatments are intended to solve are actually problems at all. A new paper from Purdue University also found that neonics applied as seed treatments travel long distances from the fields where treated seed is planted, and offer minimal yield benefit when used on corn. Unfortunately, policy in Minnesota and across the U.S. still has a long way to go to catch up with this science. Our fight to protect pollinators is a small piece of a much broader struggle over the kind of state and country we want to live in. Longtime observers of the Minnesota legislative process said that they’ve never seen a session with as little transparency as we witnessed 2017. A great deal of the state budget was passed with almost no opportunity for public input in the 72 hours of special session. And legislation that landed on Governor Dayton’s desk included major attacks on immigrants, workers, water quality and local control. But I’m keeping my sights trained on the community-building and resistance that continues to reject the politics of division and scarcity. In the face of proposed rollbacks, we responded with strong organizing and exposed underhanded dealings. The people who have been directly impacted by the harms of pesticides gathered their powerful communities together to advocate for pollinators and a better food system. Organizing works, and we plan to keep doing it.